Nowadays if we surf through the app markets, there are apps for everything. The expensive communication box (or MP3 player, if you have the iPod Touch) can make fart sounds, help you learn a new language and even turn your photos into cartoon stills. In addition, it can help you get in shape or maintain a healthy lifestyle—for much cheaper than a personal trainer or nutritionist. 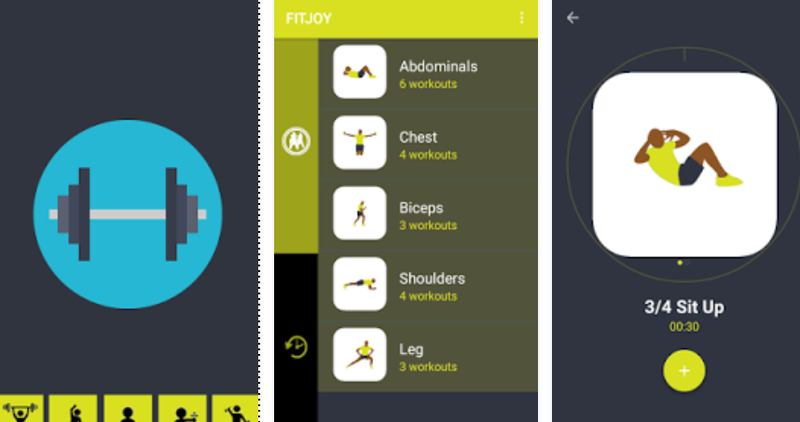 To get you started, we roundup with the best health and fitness app for your Android named, FITJOY – Simple Workout App. What is FITJOY – Simple Workout App? FITJOY – Simple Workout App will deliver everything you need and nothing you do not for an effective bodyweight exercise routine. Get off to a fast start with readymade workouts in whatever difficulty level you need. You can also design a personal workout if you want to. FITJOY – Simple Workout App uses timers according to the type of workout you choose, such as circuit training. Why this one is good for you? This app helps you to keep your body fit. Start getting abs and muscles by doing it daily. Following these daily-based workouts will make you feel stronger, healthier, improve energy and control weight. These workout Exercises benefits every part of the body and you do not need any equipment for the workouts. In the options, you can set the desired rest time between each exercise and you can set a notification to remind you that it is time to exercise. You can also set the workout difficulty, which scales the number of reps in each exercise. This app is the most complete and simple workout plan for your daily routine. It will help you with good metabolism and helps you in developing strength against many problems. It is available free to download for Android OS devices. Direct download link to this app is present at the end.